All Fruits Come From Flowers - Fact or Myth? All fruits come from flowers. Do All Fruits Come From Flowers? All fruits come from flowers, but not all flowers become fruits. Fruits are typically derived from the ovaries of a flower and contain seeds. This means all parts of a plant that flower (including most culinary nuts and berries) are “fruits” and all non-flowering parts of plants are “vegetables”. How we classify a food often depends on if we are talking botanically, culinarily, and sometimes politically. A video discussing “what is fruit”. Botanically speaking a fruit is a part of a flowering plant that derives from specific tissue of a flower, typically from one or more ovaries, but sometimes from accessory tissue (for instance strawberries are an accessory fruit). In common terms, fruit is the fleshy seeded part of a plant that is sweet or sour and edible in its raw state. Many of the things we think of as vegetables in common terms, like bean pods or tomatoes, are actually botanically fruits. The bottom line, botanically, if it comes from a flower it’s a fruit, if it’s another edible part of the plant, it’s a vegetable. In culinary or common terms, some things we consider vegetables (like the tomato) come from flowers while some things we consider fruits (like rhubarb) are technically vegetables. All fruits come from flowers, but not all flowers are fruits. “Fruits Flowers and Seeds“. Biology-online.org. Retrieved Oct 31, 2015. “Fruit“. Wikipedia.org. Retrieved Oct 31, 2015. Thank you for teaching me about beans. It has bean a pleasure. I think a fig is both a fruit and a flower, a “false fruit” like a strawberry. 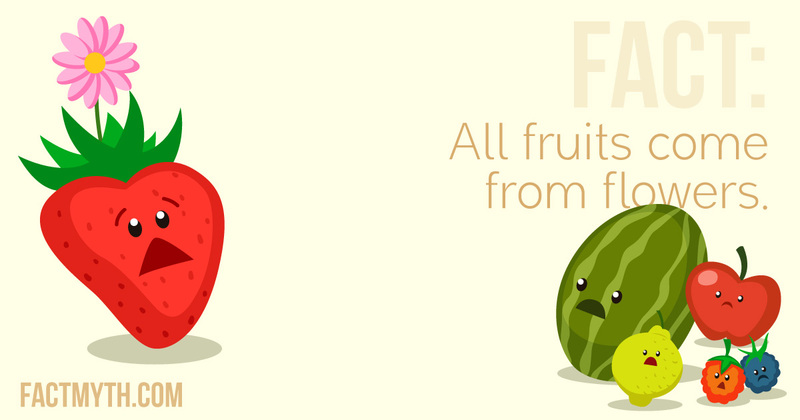 At best there are some things that we call fruits which sort of break this rule, like the strawberry or fig. But essentially all fruits come from flowers. Those are [I think, need to double check each] all fruit seeds… oddly enough. Pea pods are botanically a fruit, the peas are the seeds of that fruit. Consider the Wikipedia page on peas (which I believe to be correct): The pea is most commonly the small spherical seed or the seed-pod of the pod fruit Pisum sativum. Each pod contains several peas, which can be green or yellow. Pea pods are botanically fruit, since they contain seeds and develop from the ovary of a (pea) flower. The pea pod is thus a fruit that comes from a flower.. and its seed, a fruit seed (like most of what we call nuts and seeds). Can trees grow flowers and just flowers without also producing fruit on the same tree? Is there such a tree that has only flowers on it? Yes. All plants that produce fruit produce flowers, but not all plants that flower produce fruit. Thank you very much! One of those silly mistakes that the spelling / grammar checker in the CMS didn’t catch (and in this case, our own human editors didn’t catch either). Much appreciated. The only exceptions are things we call fruits due to the way they are used in the kitchen that aren’t actually fruits botanically speaking (like rhubarb, which is a vegetable).